We were asked by our clients for a solution to the problem they were having with a shaded area of their garden. This area had a shadow cast over it by the walls of the property, and due to the direction of the sun this garden lacked natural sunlight, this meant that the turf had not faired very well in these conditions. We were able to suggest a variety of shade tolerant plants for this area. The area to be planted was approximately 25m2. 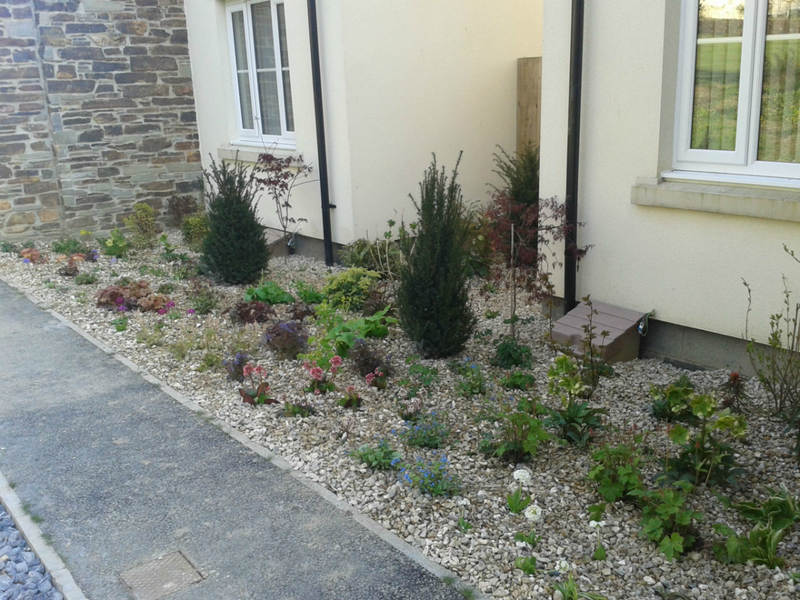 We stripped what was left of the old turf and laid weed suppressing fabric before planting with the suggested plants, the area was then top dressed with flint stone. We will review this garden in about two months to ensure the plants are standing upto the conditions. This garden was completed by two people in one day. I have passed this garden recently and can say that it looks wonderful. The owners may have changed but the plants have not. The plants are thriving and have spread beautifully to fill the area, I didn't realize that there were specific plants for such conditions. Great job.